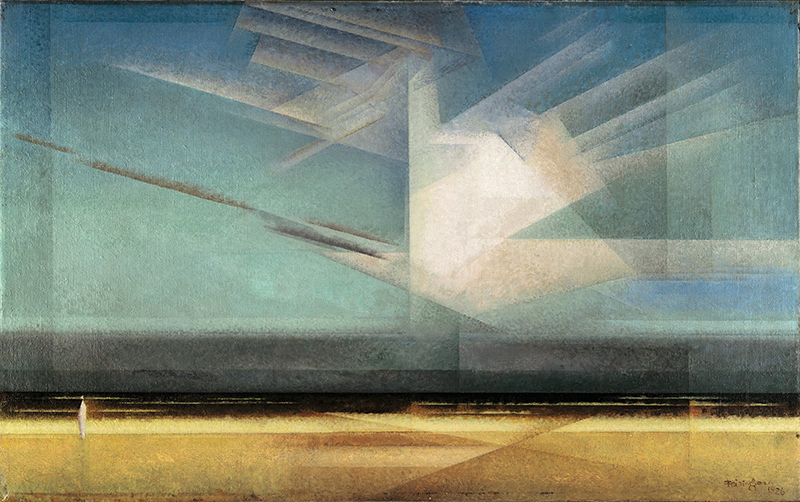 I chose the image above, Lyonel Feininger´s "Bird Cloud", as my inspiration. What I like about it, is its color scheme and the general idea of depicting a natural scenery with basic abstract forms. So I used basic forms myself, mainly rectangles, triangles and quads, to build the background and the clouds. But, at the same time, I wanted to make things look a bit more natural, so I added random offsets and transparency values to the stripes of the background, thus simulating something like weather conditions. Same with the clouds, which evolve in a quasi-natural way by sliding in from left and right. The position can be determined by the first click on the screen, leading to individual constellations of overlapping forms.